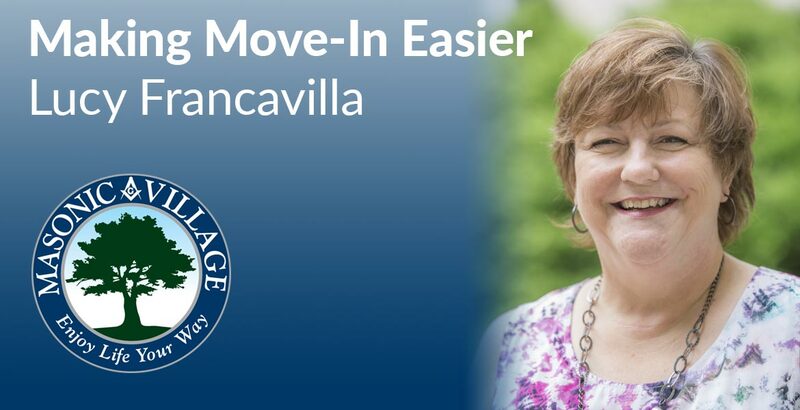 Lucy Francavilla may be a new face in the Sales & Marketing office, but she’s become an old friend to the incoming residents she has helped settle into Masonic Village at Elizabethtown in her role as the inaugural Move-In Coordinator. “Although we have a long history and plenty of experience successfully moving hundreds of residents in over the years, we felt we could improve our process…. My position was created to do just that,” Lucy said. Although she is new to this role, she is not new to Masonic Villages. Previously, Lucy worked as a CNA in the Masonic Health Care Center, a job she took after six years caring for her mother-in-law. Her current job draws on a different set of skills – the ones she acquired while getting her bachelor’s degree in business administration from Tarleton State University – and real estate\business management background, but is still based in maintaining resident well-being, just like her previous role. “My husband saw the posting and said, ‘Babe, this is you,’” she said. The main responsibilities of a typical workday for Lucy include managing residents’ move-in paperwork and communicating with them as they progress through the steps to move-in day. “My focus is on assisting new residents with their move-in process by coordinating with community team members on the refurbishing, cleaning and inspection of cottages and apartments after move-out and before move-in. I communicate the status of all prospective move-ins with the Sales & Marketing Team and provide administrative support for our great team,” she said. “Start early when you will have the most options and most control of your choices. At a minimum get your name on our waiting list,” she said. According to Lucy, “mentioning the words ‘move in’ can create all kinds of different emotions” – including a sense of anxiety. But take a deep breath and remember Lucy’s advice: stay calm. You’re in capable hands. “With the assistance I provide, I am confident I can guide you so that your move will go smoothly. I will educate and assist you with all the steps necessary and will be just a phone call or an email away,” she said. An Elizabethtown resident since 2002, Lucy enjoys “crocheting, knitting, crafts, reading and marking things off my bucket list.” If you see her around campus, ask her what good book she’s reading, or to tell you a funny story from her “endless supply” of tales featuring her family members: husband, Al; daughter, Kelsey; stepdaughter, Jennifer; mother, Martha, and, of course, the dog, Charlie Brown. 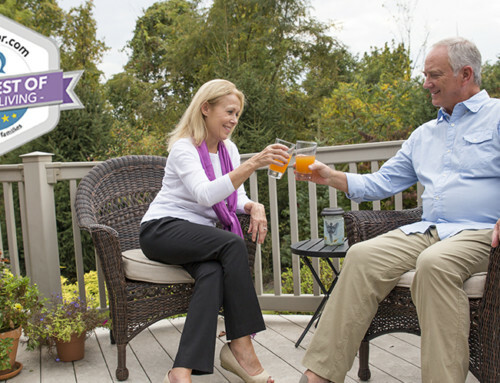 Feeling the Downsizing Dumps? Here’s 5 Helpful Hints.